A few weeks ago I wrote “tablet and handheld manufacturers could include OS drivers for external storage and make this whole nightmare” for mobile backup up go away. Looks like they have with a feature called USB Host. You need a USB On The Go (OTG) cable, which is male micro USB for your phone, to standard female USB for your storage device. Be aware, USB Host doesn’t work with all drive formats (just like desktops and laptops). 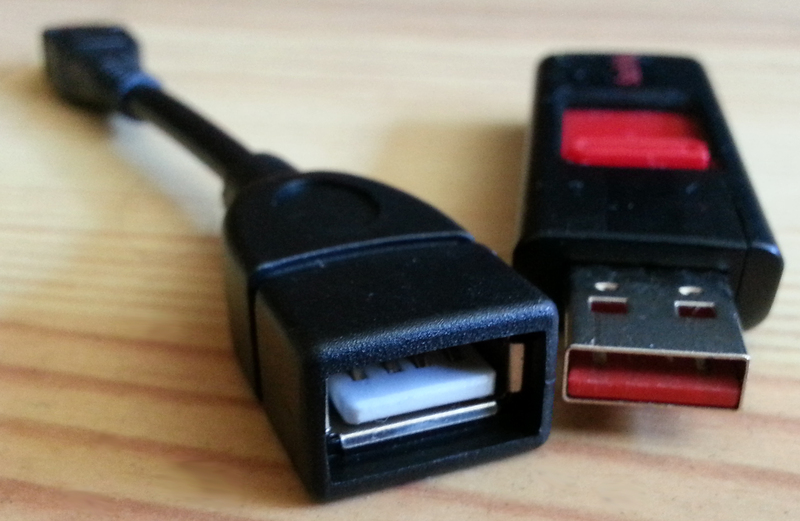 Here’s a video demonstrating USB Host on the Samsung Galaxy S3. I found moving files to/from a thumb drive very straight forward using the phone’s operating system and with the Astro file explorer app. The thumb drive was as easy to use as internal memory. This is a huge step forward for mobile devices, allowing us to quickly backup our data to portable, external storage via USB. Not only sneaker-net, but a quick backup to external storage is something media professionals need. A lack of WiFi doesn’t have to be a deal breaker. A laptop/desktop is not required. A mobile only solution is much more possible now.